Hawkmoth Legion Garrison is the headquarters of the Imperial Legion, located on the north side of the middle section of Ebonheart. This fort is located in the heart of Imperial power in Ebonheart. A wide variety of services are provided, though some only to higher ranking members in the Legion. You must, of course, wear a uniform to speak to most of the people here if you are a member. Among the notable occupants are Frald the White, who gives a number of quests for the Legion, and Sirollus Saccus, who would be the Master trainer for Armorer were it not due to an oversight which prevents him from offering training. 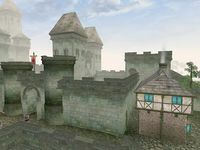 The fort also serves as a jail for the city of Ebonheart and its surrounding areas. You'll see three prisoners locked away on the lower level, though none has anything very interesting to say. The fort has six towers, none of which are directly connected to the fort. There is a guard in one of them, but the rest are completely undefended. There is very little worth stealing, however, in either the towers or the fort itself. One thing to note is the Chest marked "Evidence", located in Sirollus Saccus' smithy area. If you are arrested and sent to jail near Ebonheart, your confiscated goods will be found here. If you are a Legion member of Knight Protector rank or higher, you can freely take your stuff back without consequence. Otherwise, you must be sneaky about it. * Sirollus Saccus was presumably intended to be the Master Trainer for Armorer, but does not offer training for some reason.